BOSTON, MA--(Marketwire - May 11, 2010) - Seventy-five stroke survivors from across the Commonwealth will gather today at the State House to meet with their legislators and tell their stories to kick off American Stroke Month. The event, hosted by the Massachusetts Department of Public Health (MDPH) and the American Stroke Association (ASA) will help spread the message that recognition and timely response to a stroke can significantly reduce the debilitating effects and even death. Throughout the day, stroke survivors, some accompanied by their doctors and caregivers, will tell their story and encourage legislators to continue to fund the stroke awareness programs that are so important in the State. The Massachusetts Department of Public Health reports that stroke is the third-leading cause of death in Massachusetts and the US. The American Stroke Association stresses that knowledge and awareness of the stroke warning signs can prevent death and disability. Many of the survivors attending today's event received tPA because they arrived at the hospitals immediately after their stroke started -- and they credit it with saving their lives or giving them back their independence. A clot dissolving drug, tPA represents a major advancement in treatment for ischemic stroke, and can significantly reduce the debilitating effects of stroke if administered within the first few hours after the onset of symptoms. It is estimated that only 3 to 5 percent of stroke patients receive this treatment currently, due to inability to recognize the early warning signs. Unfortunately, most patients do not seek treatment in time. "With the breakthrough of tPA, is it clear that recognizing the early warning signs of stroke can significantly alter a patient's outcome after stroke," said Lee H. Schwamm, MD, FAHA, Volunteer, American Stroke Association; Vice Chairman, Department of Neurology, Director, TeleStroke & Acute Stroke Services at Massachusetts General Hospital. "Not only can we improve the odds of a great recovery for stroke survivors, but we can also save the healthcare systems millions of dollars on the medical costs required to treat the devastating consequences of stroke, such as inpatient care, rehabilitation and follow up care. This is because stroke is a leading cause of serious, long-term disability." Frank Mastrangelo, of Shirley, MA, a stroke survivor, will share his story at the event as will Representative Michael Rush (D-West Roxbury). In a recent statement, Senator Mark Montigny (D-New Bedford) commented, "We have worked incredibly hard to increase public awareness so that more people will recognize signs of a stroke. By promoting the F.A.S.T. (Face, Arms, Speech, Time) signs we're literally saving lives. We need to continue to educate the public that if they see any observable signs they need to call 9-1-1 immediately, because when someone is having a stroke every second matters." Every year, 18,000 people in Massachusetts are hospitalized with a stroke, and of those strokes, about 3,000 are fatal. Knowing the signs of stroke can save someone from a permanent disability or even worse. The Massachusetts Department of Public Health and the American Stroke Association are working together to spread the message that quick recognition and response to a stroke can help save lives. For additional information visit www.StopStrokeActFast.org, to watch Public Service Announcements in English, Spanish, and Portuguese, read stroke survivor stories and get links to important information from the Mass. Department of Public Health and the American Stroke Association. The mission of the MDPH Heart Disease and Stroke Prevention and Control Program is to provide statewide leadership to reduce disease, disability, death, and disparities across the continuum of care for heart disease, stroke, and related risk factors by collaboratively promoting evidence-based policy and environmental changes. www.mass.gov/dph/heartstroke. The American Stroke Association is a division of the American Heart Association that focuses on reducing risk, disability and death from stroke through research, education, fund raising and advocacy. The American Heart Association created the American Stroke Association after many years of increasing emphasis on stroke. We spend more money on stroke research and programs than any other organization except the federal government. For more information, visit www.strokeassociation.org. 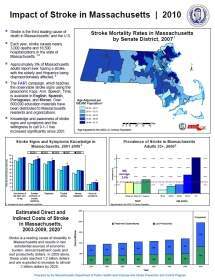 Stroke is the 3rd leading cause of death in Massachusetts with 3,000 deaths and 18,500 hospitalizations. Stroke is also the leading cause of disability and results in two substantial sources of economic burden, clinical treatment costs and lost productivity dollars. In 2009 alone these costs reached $1.2 billion. By having people know the warning signs and symptoms and know to ask for tPA, greatly reduces long term affects.